The red poppy, a native plant along much of the Western Front during the First World War, has become a powerful symbol of remembrance. It is the principal emblem of the Royal Canadian Legion, which distributes several million each year to be worn by Canadians on Remembrance Day. The blood-red poppy had long been associated with the fighting armies of Europe, and the flowers often overgrew the mass graves left by battles. During the First World War, enormous artillery bombardments completely disrupted the landscape, infusing the chalk soils with lime. The poppies thrived in the environment, their colours standing out against the blasted terrain. In 1921, the Great War Veterans’ Association, the largest of several Canadian veterans groups, adopted the poppy as a symbol of remembrance. The Canadian Legion, formed in 1925, continued this connection. 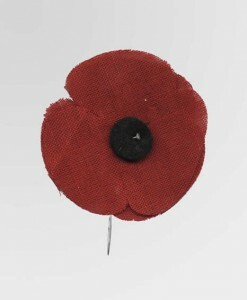 The poppy was worn on the left lapel and close to the heart to recognize the sacrifice of soldiers in times of war. They were initially made by disabled veterans and the proceeds of sales, then and now, go towards funding veterans’ needs. The poppy remains an enduring symbol of remembrance in Canada, Great Britain, the nations of the Commonwealth, and in the United States for those who served or fell in service of their country. An undated example of a handmade poppy. First World War veteran James Stanley Taylor, who served with the 14th and 174th Infantry Battalions, donated this poppy to the Canadian War Museum. Veterans' magazines and organizations urged Canadians to buy poppies handmade by veterans which were 'true memorials', as opposed to commercially available copies.